Venezuelans protest severe food and medicine shortages in Caracas this month. Each day Venezuelans – especially the poor – haunt desperately long lines for scarce food, medicine and other basics. Violent crime is so rampant that citizens are morphing into rabid vigilantes. Some recently beat a mugger to death and burned his corpse after he robbed an old man of $5. In fact, news reports from the South American country read like apocalyptic Cormac McCarthy novels. And it’s only going to get worse. Maduro’s government just announced it has to slash imports – mostly food and other basics – from $37 billion in 2015 to $20 billion this year. The one problem, say analysts like Russ Dallen of Caracas Capital Markets, is that Venezuela may not have $20 billion left in its chest. Maduro's solution? He's threatening to choke what little oxygen is left to the economy – ravaged by collapsed oil prices and his collapsed sense of reality – by confiscating even more private companies. So regime change in Venezuela will probably happen soon, right? For all the disaster it keeps raining down on Venezuela, the socialist revolution that’s ruled for 17 years could rule for another 17 – and it’s time we started swallowing that North Korean-style reality too. For all the disaster it keeps raining down on Venezuela, the socialist revolution that's ruled for 17 years could rule for another 17 - and it's time we started swallowing that North Korean-style reality too. Authoritarian regimes in Latin America – Pinochet's in Chile, for example, or the PRI's in Mexico – have usually exited in slow motion. So while I hope I'm wrong, extracting Venezuela from the revolution’s tentacles will likely take much longer than expats in Doral will ever admit. Especially now, when the revolution’s leaders know they’ve lost popular backing – evidenced by the socialists’ landslide loss of the National Assembly in last December’s parliamentary elections – and they’re digging in more fiercely than ever to stay in power. Not just Maduro, who was installed by the revolution's late founder Hugo Chávez. But even scarier apparatchiks like Foreign Minister Delcy Rodríguez. Her father, who founded Venezuela’s Marxist party, was tortured to death by police agents in 1976. His killing was certainly reprehensible – but by all accounts it made Rodríguez a bitterly vindictive politico, the comrade who convinced Chávez to wed Venezuela to pariahs like, well, North Korea. Now she’s prodding Maduro – who just granted himself absurdly broad "emergency decree" powers – to turn Venezuelans into a mass militia to beat back an imaginary U.S. invasion. That in turn invites very real thuggery from the pro-government goon squads known as colectivos. Which brings us to the revolution’s top enforcer, Diosdado Cabello. The former engineer and army officer, who hails from a hard-bitten oil camp town, is said to have amassed more questionable wealth than any other Chavista. And he’s not about to give it up. Cabello is widely considered the capo behind the state security crackdown that led to the deaths of dozens of anti-government protesters in 2014, as well as the kangaroo-court imprisonment of opposition leaders like Leopoldo López. After the December debacle, Chavista insiders say Cabello decided it's better if Venezuela's “democratatorship” – dictatorship disguised by democratic elections – simply drops the pretense and embraces raw autocracy. 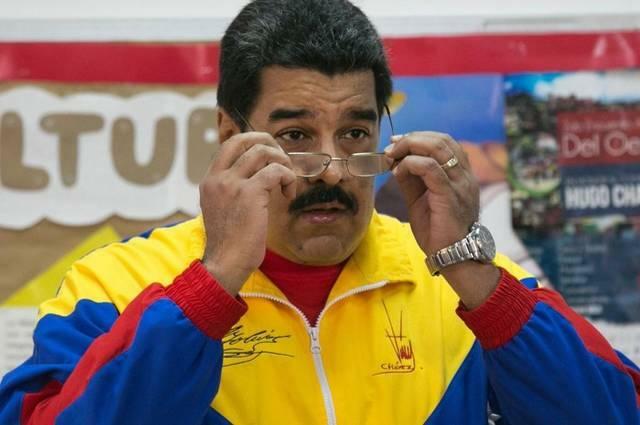 CLUELESS IN CARACAS: Critics say Maduro is blind to Venezuela's catastrophe. So the Chavista-packed Supreme Court has since blocked – fairly unconstitutionally – every reform measure the new opposition-led Assembly has passed this year. And this week Cabello made it clear the Chavista-packed election commission won't hold an opposition-led presidential recall referendum to oust Maduro. This despite the millions of referendum petition signatures gathered so far – not to mention polls that show three-fourths of Venezuelans want Maduro ushered out of Miraflores in a straitjacket. But most of those millions of Venezuelans can’t join street protests calling for the referendum. They’re too busy standing in epic queues for milk, antibiotics and toilet paper. That’s an ironic but tragic turn: The very economic catastrophe Venezuela’s socialists have created may turn out to be, perversely, one of their best political survival assets. North Korea’s leaders can only smile and nod. Venezuela’s economic disintegration has wrought severe shortages. Food, medicine, electricity. And now – ¡cónchale, chamo! – even Polar beer. But there might be one scarcity above all others keeping President Nicolás Maduro awake and sweaty at night. It’s a shortage of scapegoats. Especially U.S. scapegoats.